I think this might come as a surprise to some mobile gaming enthusiasts. NVIDIA has always avoided using big iterations of their architectures for notebooks. The reason for that was obvious, those chips require a lot of power and the only existing standard was limited to certain TDP level. However, this changed with the announcement of mobile Maxwell, as NVIDIA started to invest a lot of time into bringing high-end graphics market to notebooks. This allowed custom MXM formats to be developed and as a result, full graphics chips to be used in notebooks. This means that the gate for even higher graphics power is now wide open. There are simply no obstacles for NVIDIA to launch Big Pascal for notebooks, and it appears that it may actually happen. As revealed by a member of NotebookReview forums, NVIDIA has developed a new SKU based on MXM form factor, which is much faster than GTX 1080. 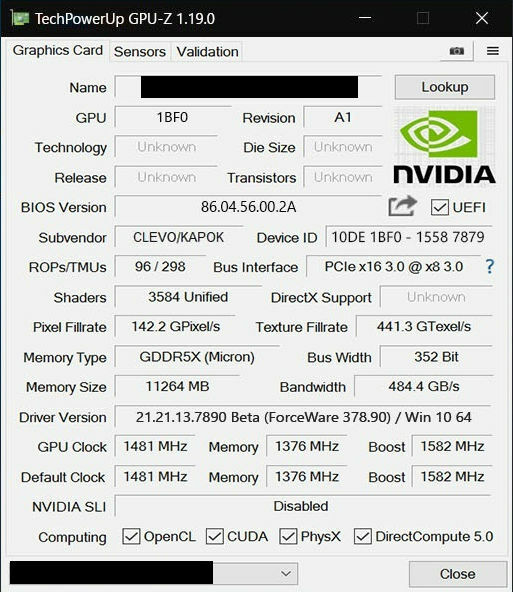 As a proof a screenshot was posted, clearly showing 11GB of GDDR5X memory and 352-bit bus. Of course, there is no Pascal GP104 with such configuration, and such memory bus is only available with one chip — Pascal GP102. Although the new card was not named directly in the post, it was discovered that the filename actually does mention GTX 1080 Ti: “KM3_1080_Ti_SCv2.jpg”. Judging from the GPU-Z screenshot, the new GTX 1080 Ti for notebooks would feature the exact same GPU configuration as a desktop variant of 1080 Ti with 3584 CUDA cores. Bear in mind that the screenshot is likely showing wrong TMU and ROP counts. 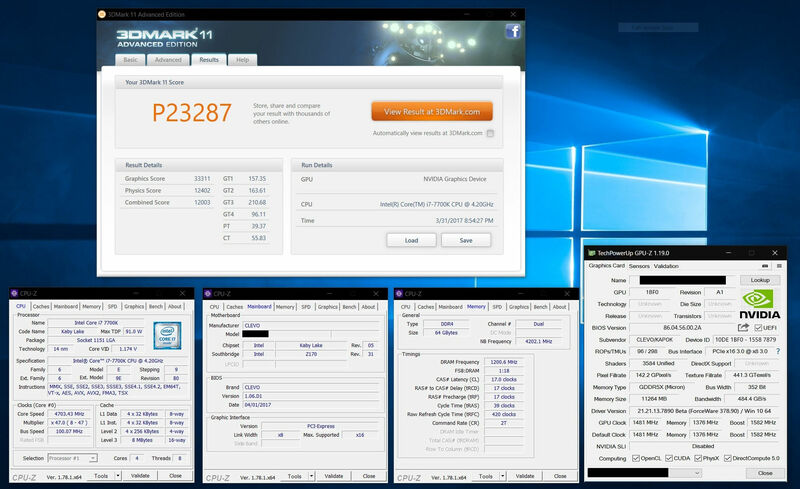 What’s also interesting is that the development board also features the same clock speeds as desktop GTX 1080 Ti, which means we are looking at full-fledged graphics cards, and 33K graphics score in 3DMark11 proves just that. There is no information about a launch date, but since we are looking at early development board, we could be looking at months rather than weeks before seeing GTX 1080 Ti in notebooks. So just enough time to sell your kidney. PowerColor teases new Red Devil, is this Radeon RX 580?